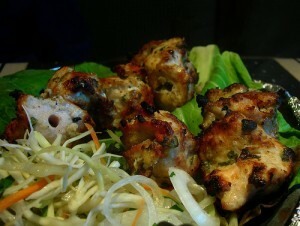 Murg Malai Kababs recipe by Nazia Nazar at PakiRecipes.com. Soak the chicken pieces in salt , vinegar , ginger juice and garlic juice for 12 to 16 hours. Now put cornflour in the bag with little salt and black pepper . Add pieces of chicken removed from garlic juice, ginger and vinegar . Shake the bag well with chicken , cornflour, salt and pepper in it. Heat the ghee to a high temperature in a deep pan. Then gradually lower few pieces of chicken and fry them golden brown on a very strong fire. For frying the second lot of chicken pieces the fat should be heated again to a high temperature. Serve it hot with green salad.